I hope you had a crafty week end and a lot of fun with the NSD ! 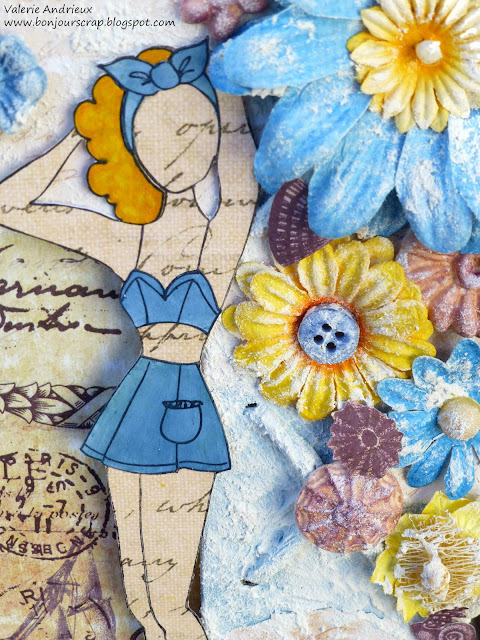 I've been crafty myself, enough to fiish a project made for the May Make it Prima challenge... Few things inspired me in their mood board : yellow and blue, the navy stripes, the Julie Nutting doll stamp, and the flowers ! 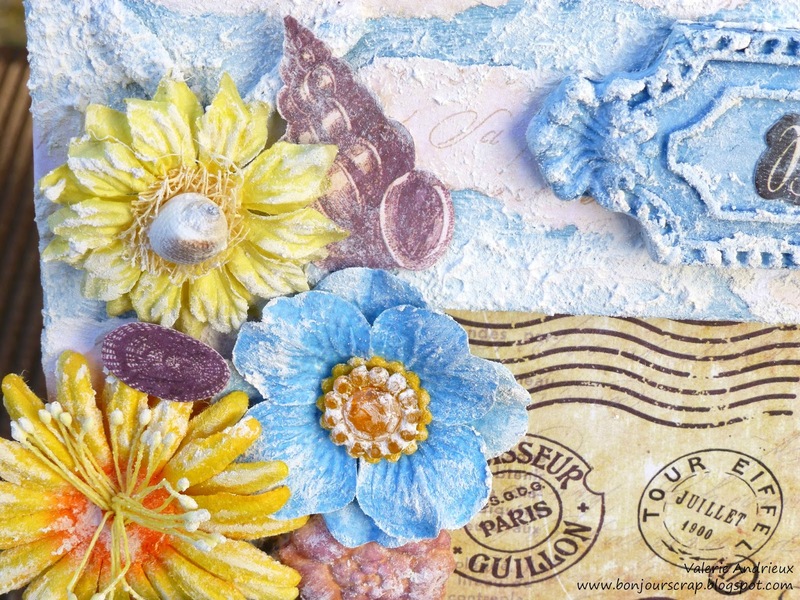 I started by covering the cardboard frame with blue paint (Reef Velvet dimensional paint by Art Anthology), stripes of French Riviera paper (Prima Marketing) and a mix of white gesso with Texture Powder (Prima Marketing). It gave to the frame a sandy beach look. I dived into my stash to find these old flowers by Prima Marketing. With few touches of the mix gesso-powder, they looked covered with sand too. As you can see, I used some IOD moulds too... 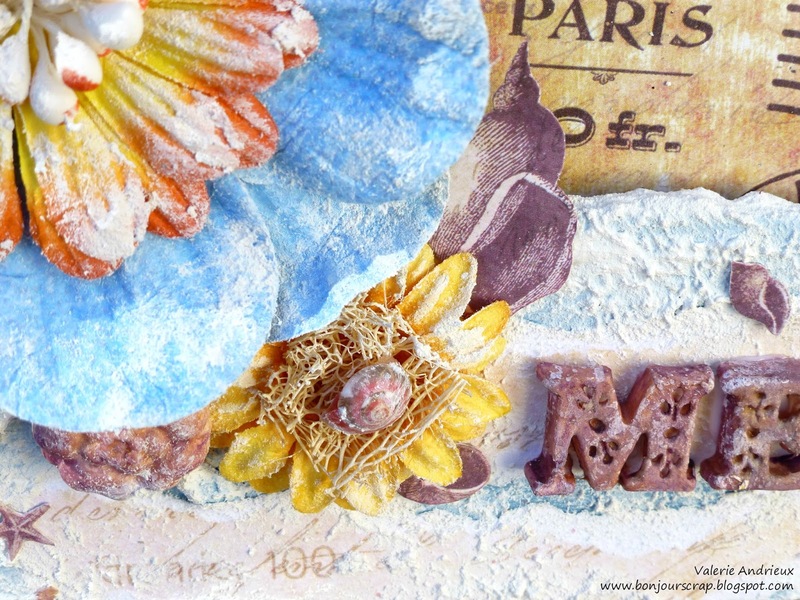 They are painted with Art Anthology dimensional paint (Reef for the tag, Portobello and Mardi gras for the flowers). This is the Julie Nutting doll stamp Betsy. Outfit is painted with the same color than the frame and tag (Reef).